CEC is thrilled by the participation, knowledge and network built through the Circular Economy Mapping Week held in over 65 cities worldwide during this past week [5th - 11th February 2018]. During this week, CEC Organizers voluntarily set up group sessions to map the circular initiatives in their cities. Workshops took place in 65+ cities, including Bangkok, Buenos Aires, Cape Town, Madrid, Montreal, New York, London, São Paulo, Singapore and Taipei. To map out circular initiatives taking place globally and make this information available online and free for all. 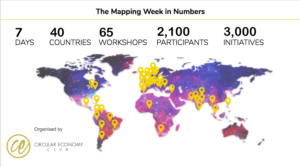 with all 3,000 initiatives identified during the Mapping Week. & learn who is doing what around the globe! CEC Mapping Organisers are local volunteers &changemakerss who wish to build a community of circular economy professionals and enthusiasts in their cities. As Mapping Session organizers, they were the visible face that brings the CEC Mapping Week to life in their cities. If you missed the application date to become a Mapping Organizer during the Mapping Week (5-11 Feb 2018), consider becoming a CEC Organizer to run a mapping session in your city at any date during the year and check the Step-by-Step GUIDE on how to run a mapping session.